If you don't want this new "feature" but still want to stick with a Chromium based browser (i.e. 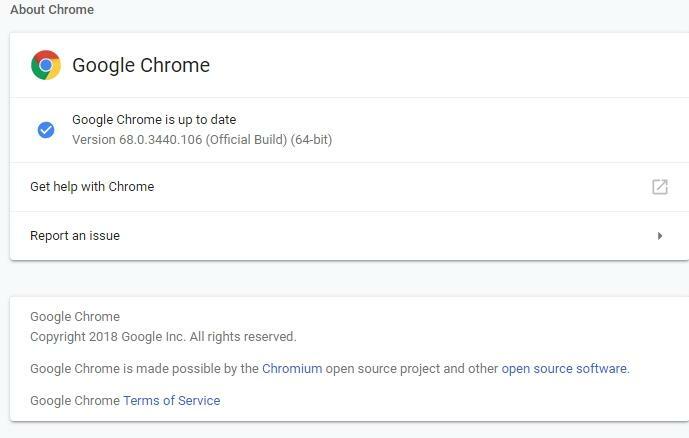 same features/functionality, including plugin compatibility with add-ons from the Chrome web store) then you can use an alternative such as SRWare Iron or Chromium itself (the source upon which Google's browser is based), both of which will function essentially the same except without any of the Google tracking/ad content built into it and without this new "feature". I'd not heard of these browsers before. So took a punt and installed SRWare Iron … first opinion was that it was okay. Short lived though, as that is now un-responding exactly like Chrome! Also, there are a couple more options with regards to Chromium based browsers in case you want to try another alternative. There is Opera as well as Vivaldi, both of which are based on it but include enhancements and modifications of their own (SRWare Iron is probably the most basic and nearest to the essential functions of vanilla Google Chrome, though as with them all, you can customize it heavily via settings as well as plugins/extensions/add-ons/themes etc.). Like many with Windows 10 version 1803, is never a point that we aren't cursing our electronic device or Microsoft itself for SOMETHING we now have to troubleshoot. During my latest survival of chaos though I encountered a new form of a block of not only Malwarebytes, but my Spy Bot 2 as well. Nor does it stop there!! Many have had issues since v1803 came out & it covers a wide range of things. Now Google Chrome & Microsoft have messed up trying to fix the compatibility as well as get ahead of the other. Which has resulted in some of us who use Chrome to be finding no browser the next day or what not. After 2 day's of chasing answers online using a vast combination of phrases, was able to slowly chase down my issue. 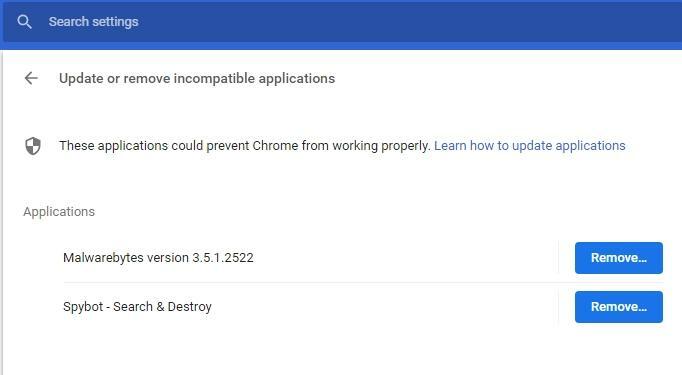 Under the Advanced Tab of Chrome 68 was a shocking revelation: Malwarebytes & Spy Bot 2 PREVENT CHROME FROM WORKING PROPERLY & NEED TO BE UNINSTALLED. I had by the time I found this out, run SFC, DISM, System Refresh & Restore, & so many scans with so many products trying to figure out why my PC was acting strange. Adding to the chaos was that it was never the same problem twice!! which did nothing to assure me. Google is preparing to roll out a new formula that is going to BLOCK any program that injects into their sites. THAT means our Malwarebytes & any other AV program will be rendered null & void on ANY GOOGLE FORMAT!! Knowing that this would be hard to believe is why I have attached the screenshots' I have to verify these findings. Personally I run Ad Guard Pro, Web of Trust, Malwarebytes, Spy Bot 2, Windows Defender Firewall & Smart Screen on my system to try & get a warning at least of sites or downloads that are going to be a big regret later. So any time a site or program wants me to turn 1 of these off, I hit the back button & go elsewhere! It may not be the strongest but it is Protection for my system> And when that Protection is forcibly removed or banned it has me wonder what they have to hide or worry about. ESPECIALLY when using Google!! Ever look at how easy & cheap it is to get yourself registered for a website? ANYONE can & does EVERY day!! We have no idea if the site is legit or not from 1 visit to the next if we are honest with ourselves. If we could verify the safety every time we click a mouse or tap a key we wouldn't have gotten Malwarebytes to begin with. I don't even allow the family to connect their mobile devices to the PC until the USB scanner as well as the Protection on the PC all have had their scan & given a clean rating! Google is no different. NOW they are going to block these??? I've been having the same problem. It began in July with the message from Google Chrome but recently it has been resulting on my computer and browser freezing every minute, for about 1-2 minutes, then randomly completely freezing. Has anybody found a solution? Or would I have to use another browser, indefinitely? 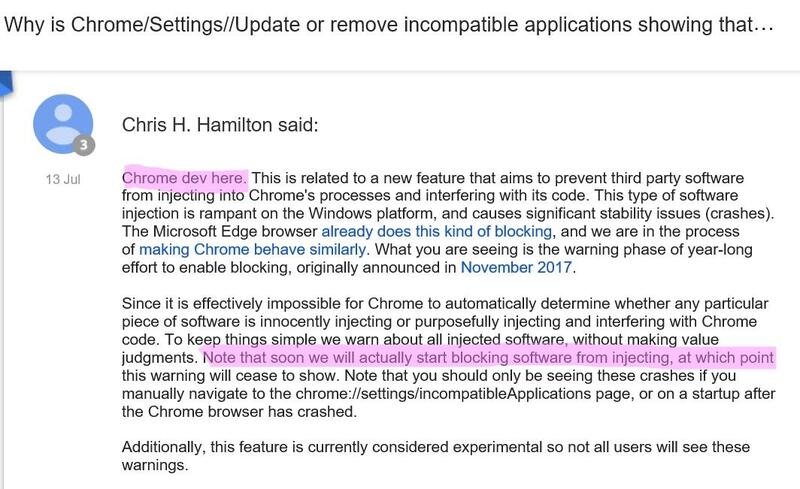 The issue with your browser and computer freezing is unrelated to the messages being displayed in Chrome as that was specifically because Google decided to no longer allow any software to inject DLLs into the chrome.exe process, which the latest versions of Malwarebytes are now compliant with having removed Chrome from the list of shielded applications by the Malwarebytes Exploit Protection component in Malwarebytes 3. 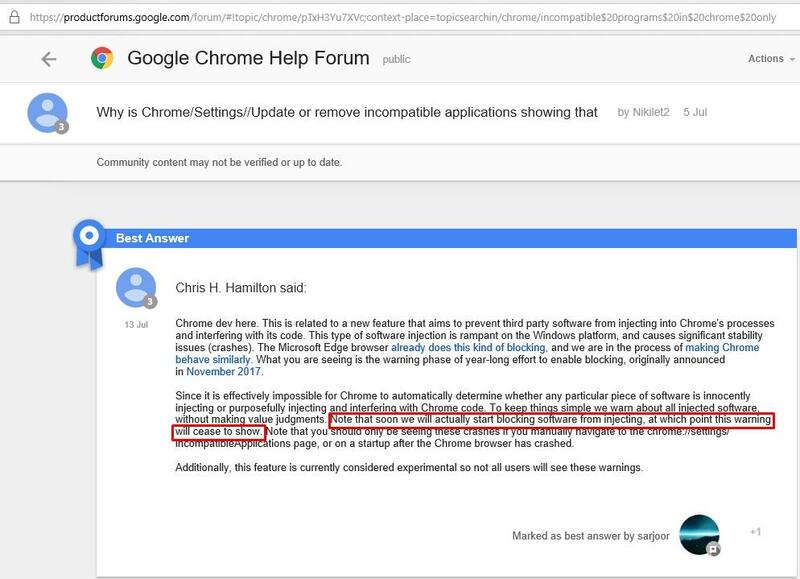 If you continue to have issues with Chrome and they seem to be related to Malwarebytes, then please create a new topic in this area to receive assistance with that by clicking here. If the issue is just with Chrome and is unrelated to Malwarebytes then you may try seeking assistance in our General PC Help area by creating a new thread in that area by clicking here or of course you may seek assistance from Google directly if you prefer by visiting their support area on their site.